Check out the latest jam-packed-with-news edition of the Norwood News, which on streets and online now. Here's a quick preview to get you started. Local residents continue to use Harris Field, which is contaminated in parts with high levels of lead. Concerned residents say the city isn't doing enough to keep people out of the site. 1) Someone called the Norwood News office today to say he saw more people using the fields and was incredulous to find no signage declaring the site contaminated. There is one sign saying "Danger" and telling people to stay out because it's a construction site, but it obviously is not keeping people out. Find out everything going on for Bronx Week. 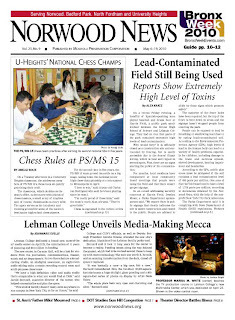 Lehman College recently unveiled its multi-million dollar Multimedia Center. The PS/MS 15 chess team won its second national chess title in five years. The Dept. of Transportation is studying and will make recommendations on how to mitigate the congestion on Gun Hill Road, which was recently named the Bronx's most dangerous road in terms of traffic accidents and fatalities. With the weather warming, Devoe Park is again turning into a haven for raucous late-night/early-morning parties, local residents lament. Youth theater director Carlos Laboy is being forced to take a break from the work he loves while he gets treated for cancer. Beloved St. Ann's Priest Misael Bacleon ("Father Mike") passed away last week.